The Starz Original series Counterpart began production on the 10-episode first season of the spy thriller starring J.K. Simmons from MRC (Media Rights Capital), Gilbert Films, and Anonymous Content. Filming has commenced in Los Angeles and will continue in additional locations across the U.S. and Europe in 2017. Check out the first photos from the show in the gallery below! The espionage thriller with a metaphysical twist stars Oscar winner J.K. Simmons (Whiplash, The Accountant, Juno), Olivia Williams (The Sixth Sense, Hyde Park on Hudson, Manhattan) and Harry Lloyd (The Theory of Everything, Jane Eyre, Manhattan). Academy Award nominee Morten Tyldum (The Imitation Game, Passengers) directed the first episode. 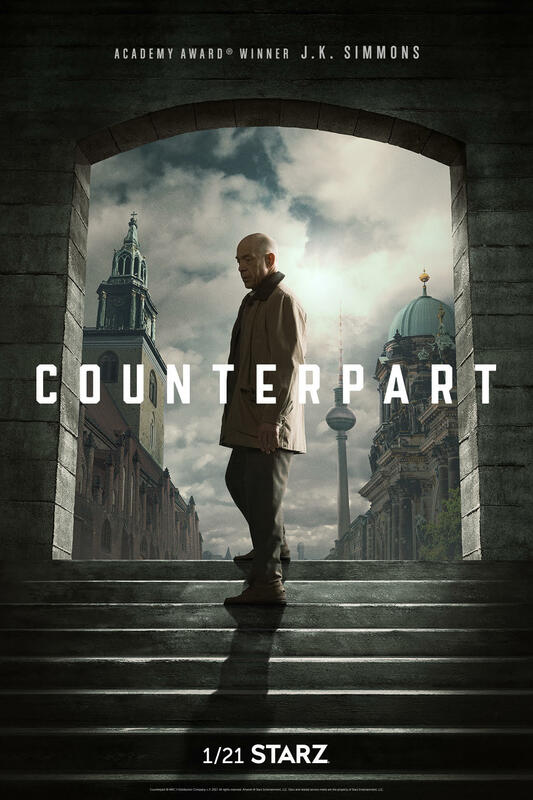 Counterpart is the story of ‘Howard Silk’ (J.K. Simmons), a lowly cog in a bureaucratic agency, who discovers that the agency he works for is really guarding a crossing into a parallel dimension. Through Howard and his “Counterpart” on the other side, the show will navigate themes of identity, what ifs, and lost love. 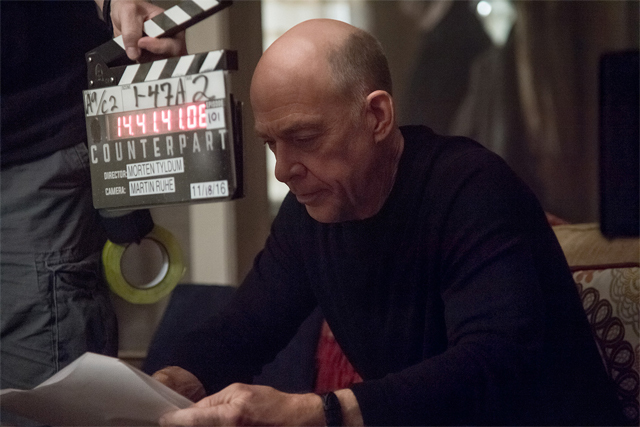 Starz ordered two seasons of 10 episodes each of Counterpart in 2015. Joining the previously announced cast is Ulrich Thomsen, taking over for Michael Nyqvist, who had to depart the series due to unforeseen scheduling conflicts, as the hardened Director of Counterintelligence at Howard’s agency and a strange mix of philosopher and spy, ‘Aldrich’ (previously ‘Chekhov’). Thomsen has an impressive body of work spanning two decades, including roles on the popular television series The Blacklist and Banshee. Olivia Williams (The Sixth Sense, Hyde Park on Hudson, “Manhattan”) stars as ‘Emily Burton Silk,’ Howard’s wife, a mysterious woman whose secrets become the centerpiece of the first season’s story. Harry Lloyd (The Theory of Everything, Jane Eyre, Manhattan) plays the role of ‘Peter Quayle,’ an upper-crust director at Howard’s agency, whose carefully calibrated career slowly begins to unravel as he sinks deeper into the world of espionage and double lives. Nazanin Boniadi (Homeland, Ben-Hur, Hotel Mumbai) plays ‘Clare,’ an enigmatic young woman of curious origin. Nicholas Pinnock (Captain America: The First Avenger, Marcella, A.D. The Bible Continues), plays ‘Ian Shaw,’ an aggressive operative and watchdog whose job is to ensure an uneasy peace between both dimensions. Sara Serraiocco (Salvo, Cloro, Worldly Girl), portrays ‘Baldwin’ a mysterious assassin whose life takes on a new purpose when she is exposed to the other side. Norwegian-born director Morten Tyldum is best known for his Oscar-nominated work on The Imitation Game (2014), as well as for Headhunters (2011), and Buddy (2003). Tyldum also directed Jennifer Lawrence and Chris Pratt in the upcoming space epic Passengers, scheduled for a Christmas 2016 release. Created and written by Justin Marks (The Jungle Book), Counterpart is executive produced by Tyldum and Marks with Amy Berg (Da Vinci’s Demons), Gary Gilbert (La La Land) with Gilbert Films, Jordan Horowitz (La La Land), Keith Redmon (The Revenant) and Bard Dorros (Spotlight) with Anonymous Content. Simmons also serves as a producer.